The 2nd Thousand Oaks Chick-fil-A opened today, Thursday, May 29th. 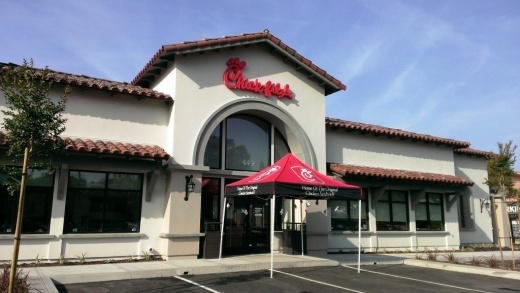 New Chick-fil-A structure has taken shape in Thousand Oaks. Posted 3/28/14: The Chick-fil-A being built at 449 N. Moorpark Road (corner of Moorpark Road and Brazil St at the old El Torito spot) is currently scheduled for a May 15 (changed to 29th), 2014 grand opening date, according to www.chick-fil-a.com/Locations/Openings. The grand opening of a Chick-fil-A is a big deal to many because they offer free weekly meals for a year to the first 100 customers at each new location. Details at www.chick-fil-a.com/Locations/First-100.